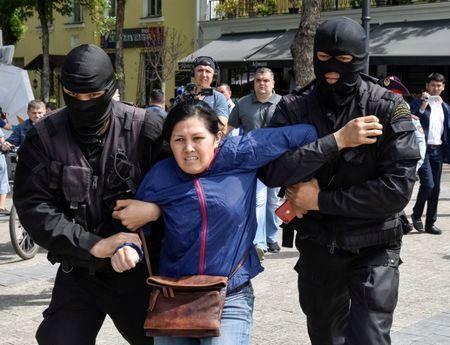 ALMATY (Reuters) - Kazakh police detained dozens of people who demonstrated in the Central Asian nation's biggest city on Thursday after an opponent of President Nursultan Nazarbayev urged his followers to protest. Public protests are rare in the former Soviet republic of 18 million. All rallies must have permission from the authorities and Nazarbayev, head of state since 1989, wields sweeping powers. 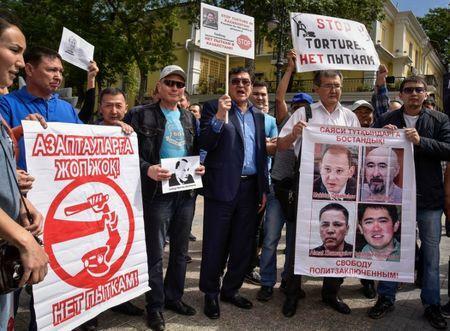 More than a hundred people attended the protest in downtown Almaty, some carrying banners saying "Freedom to political prisoners" and "Stop torture". Police quickly dispersed the crowd. A Reuters correspondent at the scene saw police detain at least 50 people. 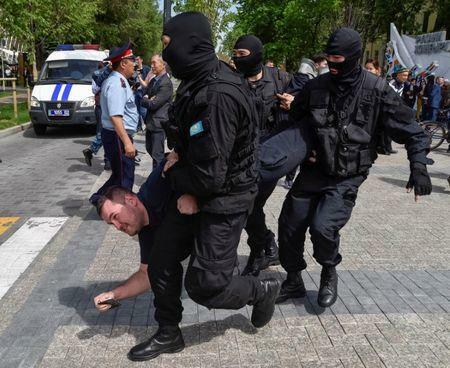 The Almaty police department said in a statement that some of the protesters had been taken to a police station "to determine the circumstances" of the event. The rally was organised by Mukhtar Ablyazov, a former banker and a fierce critic of Nazarbayev. Convicted in absentia on fraud charges at home, Ablyazov lives in France and has used social networks to recruit followers in the oil-rich nation. A Kazakh court ruled in March that his political movement, Democratic Choice of Kazakhstan (DVK), was extremist, meaning its supporters could face criminal prosecution. Nazarbayev, 77, who routinely wins elections with more than 90 percent of the vote, appointed Ablyazov energy minister in the 1990s, but their relations soured in the 2000s. Kazakh authorities say Ablyazov instigated and bankrolled a series of protests across the country in 2016 that forced Nazarbayev to delay an unpopular land-ownership reform. They also accuse Ablyazov, who a French court ruled against extraditing in 2016, of embezzling billions of dollars from BTA, the bank he used to run. Kazakhstan has indicated it may also press charges of murder against him. Ablyazov has dismissed the charges against him as politically motivated.